Think Your Yuletide Traditions Are Strange? I Wouldn’t Bet On It. Every family celebrates Christmas in its own unique way. We all have Yuletide traditions and customs that are personal to us and resonate with all the emotion (both good and bad) of the Christmases we experienced with our parents and grandparents. It’s a time of high emotion and many of us will fight to preserve those little rituals that add meaning and respect the history of our family. For us it’s carols on Christmas Eve in church, prepping veg and indulging in a liqueur or two. All pretty low key but then I find by the time I’ve planned, shopped and stressed, by the time Christmas arrives I’m pooped. A sentiment which I’m sure will be echoed by knackered parents right across the land! There are, though, some Christmas and New Year traditions which make our little pleasures pale into significance. You have probably heard of First Footing Hogmannay in Scotland. To ensure good luck for the house the first foot across the door in the New Year should be a dark male and he should bring with him pieces of coal, shortbread, salt, a black bun and a dram of whisky. 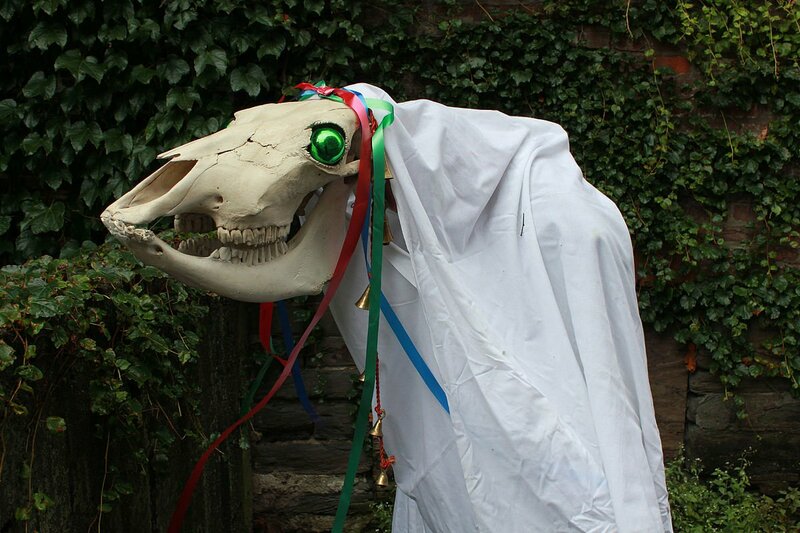 Or then in Wales we have Mari Lwyd – a folk custom from South Wales. The involves the use of a hobby horse made from a horse’s skull mounted on a pole and carried by someone hidden under sackcloth. Traditionally carried out by groups of men, they would form into teams to accompany the horse around the local area where they would request entry through the medium of song. The householders were supposed to deny them entry, again through song and this would go on until either the Mari Lwyd was told to go or the travellers were given entry for food and drink. I can categorically state that in over 40 years in Dinas Powys, nobody has ever turned up with a horse’s skull on a stick at Christmas. Further afield you may have heard of the Krampus. a horned figure described as half goat and half demon. 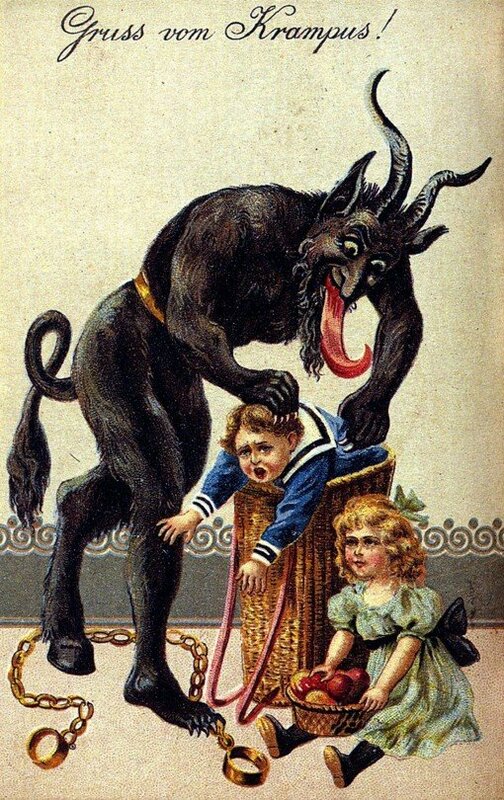 At Christmas time he likes to punish naughty children in contrast with Saint Nicholas who, of course, likes to reward them. The Krampus resides in several regions including Austria, Bavaria and Croatia and even parts of Northern Italy. Or what about La Befana, the Christmas witch from Italy? The legend goes that she was too busy with her housework to join the three wise men on their journey to take gold, frankincense and myrrh to the newborn Jesus Christ. Next day she realised her mistake and dashed after the Magi with gifts for the baby but it was too late – they were long gone. Since then, on the eve of 6th January, she flies from house to house on her old broomstick, delivering the gifts she didn’t give to baby Jesus to good girls and boys. Lastly, there’s the rather strange Gävlebocken from Sweden which involves goats – and, more specifically, the burning of the Christmas goat. There are many old Yuletide traditions in Sweden at at the beginning of Advent, homes across the land are decorated with greenery, lights and goats. The origins of this come from ancient festivals that celebrated the Norse god of thunder, Thor. Back in 1966, it was decided to use the Yule Goat as a marketing ploy to attract customers to restaurants, theatres, and other establishments on and around the square in the town of Gävle. The fire department chief’s brother oversaw the building of a huge goat that was 13 metres in height, 7 metres in length, and 3 tonnes in mass which did, indeed, attract a lot of interest from the townsfolk. Unfortunately, the goat was burned to the ground by a local vandal but his act inspired a new tradition. 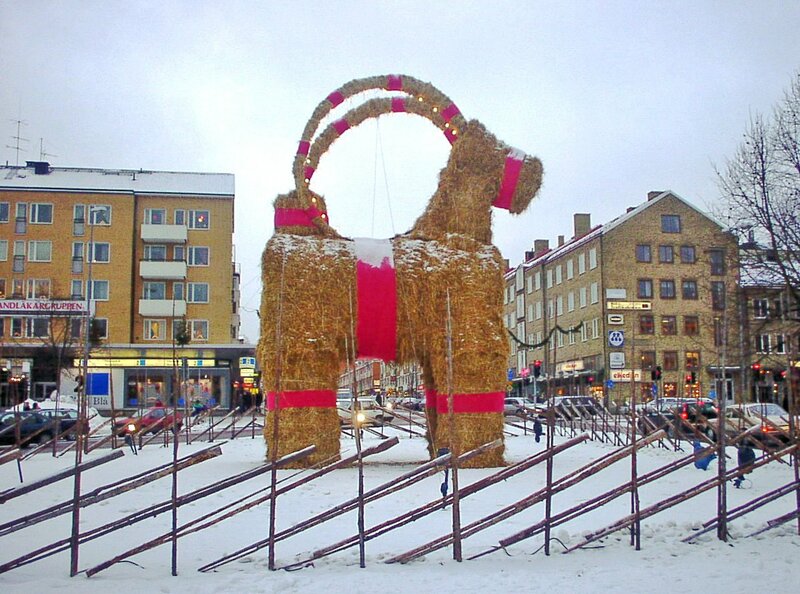 Every year, a giant wood and straw goat is built on the city centre’s Slottstorget or Castle Square, and almost every year, the goat known as the Gävlebocken is destroyed before December has run its course. It seems to be a battle between the local fire department, the townspeople and potential goat arsonists to see how soon the Christmas goat can be destroyed. And betting on the outcome is very popular with people betting on its method of destruction and how soon it will be burned after construction. These Yuletide traditions make life in Dinas Powys look positively tame. Happy Christmas and may your goats stay safe. "How To Avoid A Car Hire Horror Story Abroad"
"Share Your Money Saving Tips To Win A £20 Nando’s Gift Card"
This is absolutely fascinating and I had no idea about any of these traditions! 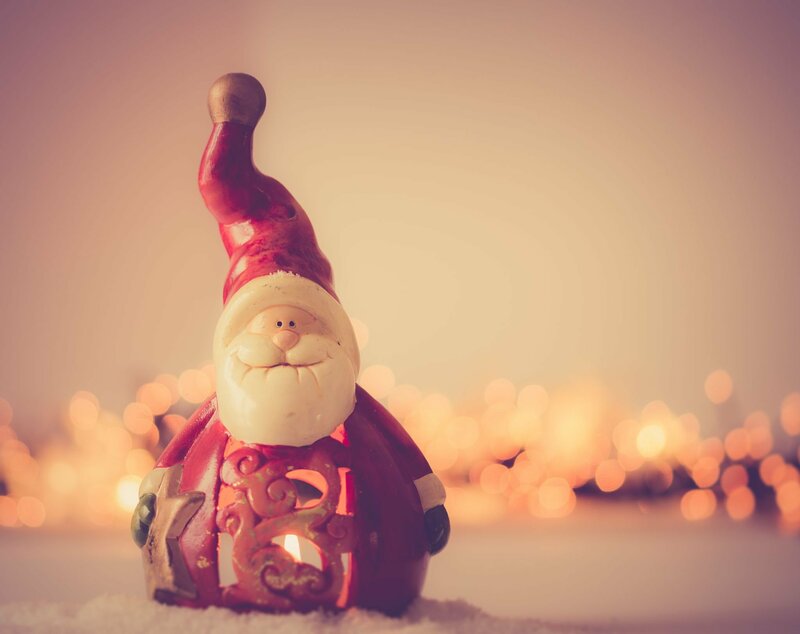 Love the sound of some of these Christmassy traditions! In Finland, our tradition is to make Himmeli. What is Himmeli? This was made from beads, but it can be made for example from drinking straws. That’s a really good idea – thank you for sharing.